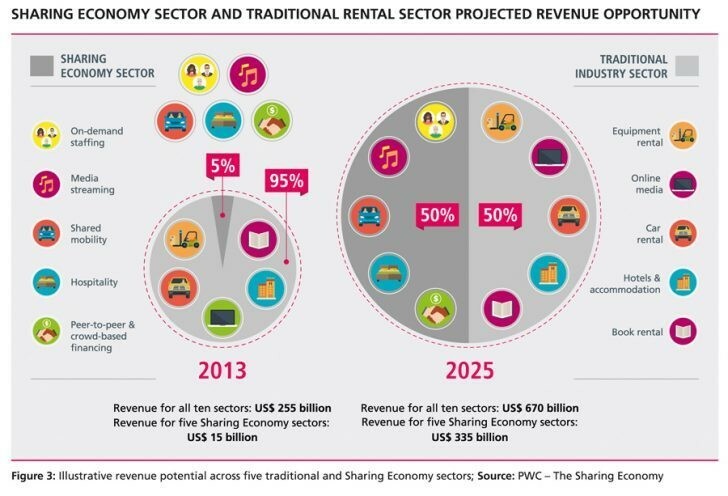 The sharing economy’s explosive growth has astounded even optimistic market pundits. On the one hand, there are now many thousands of sharing economy platforms operating in almost every sector and activity around the world. Back in 2009, there were only a handful: Zipcar, BlaBlaCar and Couchsurfing among them. Airbnb had launched in fall 2008, Uber in spring 2009. “Access over ownership” is a shift that has taken root, as digital and mobile technologies make it ever easier to access goods and services on-demand. It is no longer a millennial preference, but a part of modern society. At the same time, the sharing economy has lost some of its original allure. In the early days, it was rare not to have a conversation about how the sharing economy could responsibly mitigate hyper-consumption and truly build community connections. These benefits have not disappeared, but it is increasingly difficult to find sharing economy platforms that practise these principles in reality. The focus has shifted towards convenience, price and transactional efficiency: “community” as commodity. This year will see the first sharing economy IPOs, and it may see the first large-scale bankruptcies as well. Both Lyft and Uber have filed to go public, most likely in the first half of 2019. Uber is valued at $120bn (£94.7bn) and Lyft at $15bn (£11.8bn). Whether drivers will share in any upside remains to be seen. Changes to ownership structures that reflect the reality of today’s workforce, particularly the gig economy, are much-needed tools to address equitable wealth distribution. At the other end of the spectrum, especially in China, some sharing economy superstars are struggling. Bikesharing unicorn Ofo is reported to be on the verge of bankruptcy, while other platforms have been inundated by customers demanding refunds of their deposits. The rush to scale the sharing economy in China is unprecedented in the world; the Chinese government wants it to account for 10% of national GDP by 2020. In the race to grow, we cannot forget that building a thriving, sustainable sharing economy platform depends essentially on two elements: mindset shifts and trust. Mindsets take time; change doesn’t happen overnight. Platforms that strive to grow too fast (whether spending money too quickly, or assuming that demand will be exponential) or compromise customer trust (which is hard to build and extremely easy to lose) may find themselves facing difficult decisions in 2019. Whether Uber and Lyft are able to find a long-term sustainable business model without raising prices is a prediction I’ll have to make in 2020. In 2019 and beyond, the sharing economy will be driven increasingly by demographics that have played a (mostly) supporting role to date: the emerging middle class, women and the elderly. For the first time in human history, the middle class represents the majority of the global population – and it is projected to double in the next 10 years, to 5.2 billion people. Women are expected to be responsible for ⅔ of the rise in all disposable income in the next decade. Meanwhile, there are larger numbers of ageing residents in the US, Japan across Europe and beyond. Each of these demographics will play a bigger role within the sharing economy. The sharing economy enables people to access things they might not otherwise be able to afford, providing an onramp to greater economic participation. Women are already among the most ardent sharing-economy customers, and the growth of the “she-conomy” is likely to further boost this. And the sharing economy may gradually reshape retirement: as more people seek to age in place, need extra income or want to stay engaged in their communities, platforms such as SilverNest and GoGoGrandparent are designed to meet such needs. In 2012, I foresaw the need for policy-makers and sharing economy platforms to work together, and that outdated rules and policies would prove a sticking point. The ensuing years proved this true on a weekly basis, and at times it was excruciatingly difficult. The coming 12 months will be no less challenging for regulators, though we’ll see occasional bright spots and collaboration, particularly at the city level. Gradually, cities are learning that the sharing economy requires them to be proactive, in terms of both appropriate regulation and the harnessing of local economic development. No city has “figured it out” or developed a fully integrated strategy, though some cities have banded together and issued a declaration of common principles and commitments for sharing cities. In 2019 this momentum is likely to continue – whether it moves, however, beyond aspiration to genuine inter-city outcomes (such as policy standards implementation or collective negotiation) remains to be seen. We can also expect to see increased regulatory awareness and, occasionally, even sophistication. For example, in 2018 Denmark became the first country to enable Airbnb hosts to report income directly to tax authorities, while many places are developing transportation-as-a-service platforms to better meet the needs of all residents, including those on low incomes. We can note a sea change in how regulators have reacted to the entry of e-scooters, compared with how they dealt with ride-hailing platforms years ago. Many cities have moved to put e-scooter platforms on notice – in effect, “proceed with caution” – while others, such as Portland, Oregon, have run pilots to determine the appropriate regulatory targets. It’s still too early to know the verdict, and e-scooter companies face mounting challenges beyond public policy, but it is clear that government does not intend to stand by idly. A couple of years ago, I called out the challenge with sharing economy terminology and the growing risk of “sharewashing”: companies latching onto the term because it sounds enticing, not because there is actual sharing involved. Unfortunately, today this language remains as blurry as ever. We confuse the sharing economy and gig economy, to no one’s benefit; although there is some overlap – both the sharing and gig economy platforms help people earn income, for instance – this confusion often hampers discussions on critical issues such as the future of work. On the upside, the sharing economy is increasingly seen simply as part of “the economy”. This may be the ultimate sign of the sharing economy’s success. Whether 2019 portends more growth or difficulty for the sharing economy depends on several factors. It will be a year of reality checks and rebalanced priorities. Do we double down on responsible business, or do we turn a blind eye towards potential pitfalls or opportunities to abuse platform power? Do we return to the sharing economy’s original roots – resource efficiency, sustainability and community – or further muddy its meaning? These answers are up to us.